The most Loved game on PC..... IS NOW ON ANDROID PHONES! Download- I will provide the open links to game when i reach 1000 subscribers. so to get the link first subscribe me on youtube and then send me a message on youtube, i will reply with the links and if you are already subscribed then just send me the message on youtube. use cf3d to reduce texture quality and use qualcomm plugin. 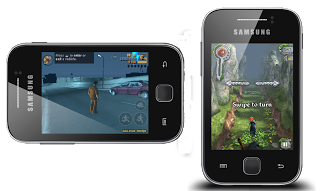 Even with the use of chainfire 3D, games like GTA 3, FLC was not running on the phone, few months ago a ROM came up name- Paraandroid which was capable to run the game about 80% playable. But the rom was crappy full of bugs. But now with these new lib files you can play these games right on stock ROM! YEAH! See the video below to see the instruction and tutorial on how to setup everything. This is an official version for ARMv6 devices which is what our Galaxy Young's processor architecture is. That means we are able to run the Mozilla Firefox Nightly build on the SGY without any problems unless the build itself has bugs and other issues which could lead to crashes. This is not a broken port but an official ARMv6 version released by the Mozilla developers. I've taken some time to try this out on the Galaxy Y and it's not that bad. What is cool about this is that you can download and install Addons to it, save whole websites as PDF files as well as installing Apps. I could not test the webpage loading speed though because I'm using a mobile data plan for an internet connection which is bad compared to a wireless network. If you are going to try this then please, leave a comment on how the web page loading performance is like on a faster internet connection. This is a rom by sohan rawat from xda-developers based off CyanogenMod7 v2 port for the Galaxy Young.